The biggest spiders in the world can have 12-inch leg spans, but spider-fearing Virginians needn't worry -- they are not found in the state. The state's largest species is the wolf spider (family Lycosidae), which measures up to 1 1/2-inches in body size and 4 inches in leg span. Other big species found in Virginia include the nursery web spider, the black and yellow garden spider, the barn spider and the grass spider. 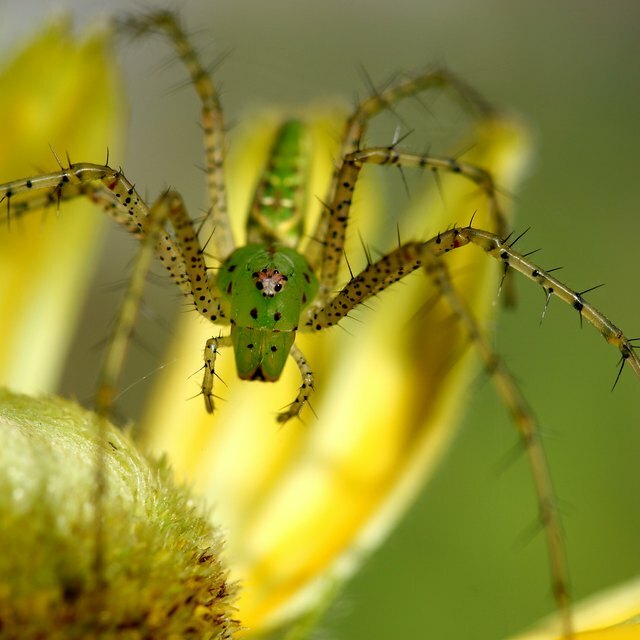 The biggest spiders in Virginia are the Wolf Spider, the Nursery Web Spider, the Black and Yellow Garden Spider, the Barn Spider and the Grass Spider. The wolf spider is often brown with white patterns. The species has eight eyes in a very distinct arrangement: four small eyes in a row, two large eyes above them and two very small eyes above the big eyes. Although they are often found on the ground under leaves and stones, they can also dig a burrow, where they hide and wait for prey. The nursery web spider (Pisaurina mira) can reach 0.6 inches; females are slightly bigger than males. They are yellowish-brown and can present a brown band with outer white stripes on the back. Nursery web spiders are sometimes mistaken for wolf spiders, because they show similar characteristics. Often found in humid areas, these spiders are active hunters. They don't build a web to capture insects, but search for prey around the vegetation. The black and yellow garden spider (Argiope aurantia) spins a web in spiral patterns, which characterizes the orb weaver family Araneidae. Females can measure up to 1.1 inches, but males are much smaller at 0.35 inch. The female is black with yellow-and-orange patterns and silvery hairs in the abdomen, but the male is often bright brown without markings. Often found in gardens, this spider is harmless to humans. The barn spider (Araneas cavaticus) is an orb weaver that can reach about 0.75 inch in size. It has a round, dark brown abdomen with markings on the back. The barn spider uses the web to capture flying and crawling insects. The grass spider (Agelenopsis sp.) is a funnel web weaver that spines a web over plants with a funnel-shaped end. Males' bodies can measure up to 0.6 inch, while females are about 0.75 inch. Zinni, Yasmin. "The Biggest Spiders in Virginia." Sciencing, https://sciencing.com/biggest-spiders-virginia-8415276.html. 10 April 2018.